FlameStone Grill in Oldsmar Florida was our destination today for what turned out to be an excellent lunch. It was our first time there and I know it is not going to be our last. From the excellent service our waiter Nico offered, to the recommendations of what to enjoy from the menu, it was a perfect experience. I had the salmon salad with goat cheese, mixed greens and fresh berries. It could not have been better! Each mouthful was a sensuous experience. Ronnie enjoyed their fresh ground steak burger with fries. Ronnie feels you can always tell the ability of the chef on how the burger is prepared. We were both extremely pleased with our meals and I sincerely recommend you give it a try for a family dining experience or to take clients out for lunch. Located at 4009 Tampa Road in Oldsmar Florida, FlameStone Grill is one place you definitely want to check out. Mobbly Bayou Wilderness Preserve has two sections: Mobbly Bayou South Support Area and Mobbly Bayou North Support Area. Both of these wonderful waterfront parks are directly on Tampa Bay and both are in Oldsmar Florida. Here you will learn about both. Mobbly Bayou South Support Area is located at the eastern end of Shore Drive, directly on Tampa Bay. This great park has a beach, picnic shelters and restrooms. It is an extremely popular destination to take the kids for a picnic and romp on the beach of Tampa Bay. Mobbly Bayou North Support Area is located off Lafayette Blvd in Oldsmar. There is a great kayak launch area in this park. From here you can travel east in your kayak to the Upper Tampa Bay Park and return on the scenic route via Mullet Creek. This is a great opportunity to enjoy the mangroves and birds along our coastline. This park is also popular with those who enjoy fishing from the shoreline. Mobbly Bayou Wilderness Preserve North Support Area also has picnic shelters and restroom facilities as well as a large playground for the kids. Oldsmar Florida is growing! Convenient to both Tampa and the Gulf Beaches, it has great schools and is close to top rated medical facilities. R. E. Olds Park in Oldsmar Florida was named after Ransom E. Olds, who was the founder of Oldsmobile and REO cars. In 1913 R.E. Olds purchased 37,541 acres of land on the northern shores of Tampa Bay and named the area “R.E. Olds-on-the-Bay”. The area became known as Oldsmar in 1937, when the town’s name was officially changed. Back when Olds built the city, there were no bridges across Tampa Bay. The only way from Tampa to St Petersburg was to come through Oldsmar. Olds had many plans for the town, including a banana plantation, horse track and a casino with a major hotel. Tampa Bay Downs has become a major attraction, bringing tourists and their horses down to Oldsmar during the winter months. It is the only Thoroughbred race track on Florida’s West Coast and is one of America’s oldest race tracks. Today R.E. Olds Park is frequented throughout the week since it offers hiking trails directly on Tampa Bay, a great fishing pier, several playgrounds, sand volleyball area, fitness equipment, restrooms, an open amphitheater, picnic shelters and fantastic views of Tampa Bay. From the shores of R.E. Olds Park you can see Philippi Park across the bay over in Safety Harbor. R.E. Olds Park is one of several great parks located in the town of Oldsmar Florida. Convenient to both Tampa and the Gulf Beaches, the town of Oldsmar is growing. Here you will find excellent public schools and lovely communities. Upper Tampa Bay Park is a gem of a park located just east of Oldsmar Florida, off Hillsborough Avenue in Tampa. 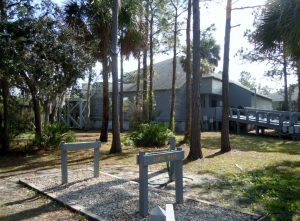 The park offers kayak rentals, picnic and grilling facilities, fishing piers, miles of hiking trails, playgrounds, restrooms, meeting facilities, summer camp and an educational center. This 596 acre natural park is bordered by Old Tampa Bay to the south and west and Double Branch Creek to the east. You kayak the creek or the bay, enjoying Mother Nature at it’s best among the mangroves and natural habitat of salt water marshes. There are wonderful picnic facilities for parties right next to the playground and there is even a volleyball court. Wander the trails and keep an eye out for osprey, bald eagle, red shouldered hawk, spoonbills and other native birds, as well as bobcat, tortoises and a variety of snakes. Remember, we do have coral snakes, rattlesnakes and cottonmouth down here, so be careful where you walk! If you are out in the water, you can enjoy the dolphin and manatee, also be sure to watch for otter! Naturally, fishing is great since there are snook, red fish and drum in these waters. Convenient to residents of northern Pinellas County, including Oldsmar, Safety Harbor and Palm Harbor, this great park is also close to Tampa’s Westchase area!